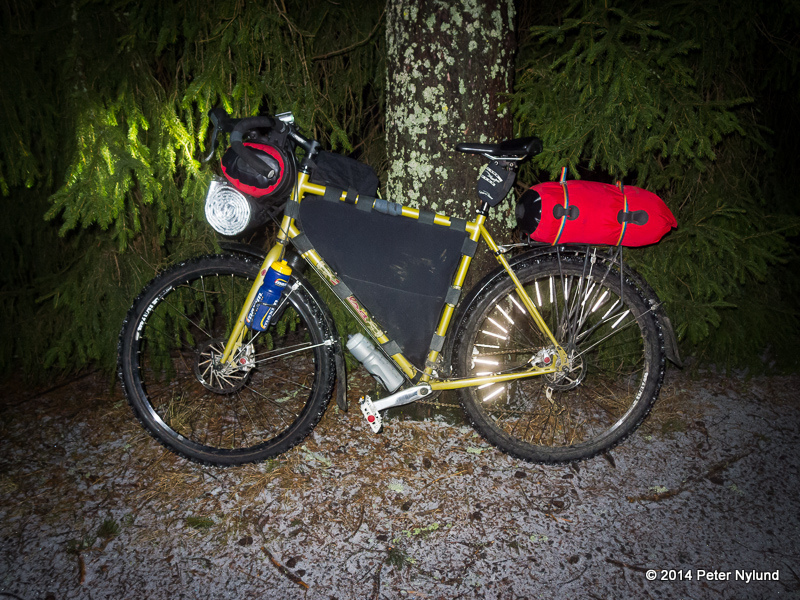 Yeti rides: Just another February overnighter. 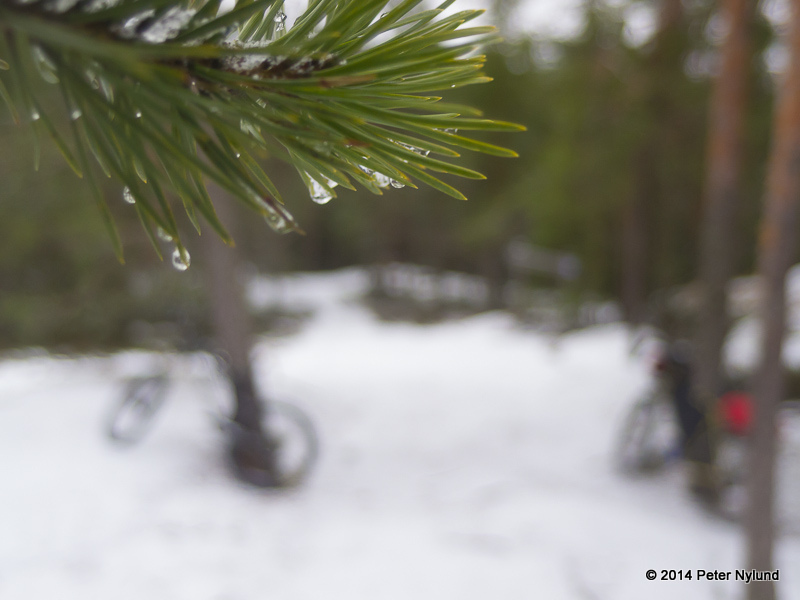 This was supposed to be the blog entry where I would write about how good a time I had at the Rovaniemi 150 race. It should also have featured photography from a nice winter landscape. Unfortunately, it didn't happen that way. One week before the race, my 8-year old son broke his thigh bone riding a pulk in high speed against a tree. The thigh bone is supposed to be the strongest bone in the human body, but it still broke into two pieces. A surgery and two hospital days later, he came home in a wheel chair, where he was to stay for a month, not putting any strain onto the leg that had been put together again with titanium. He should be back to normal in four months or so. But, in this situation my presence and help was needed at home and I couldn't go to Rovaniemi, despite everything already being arranged. 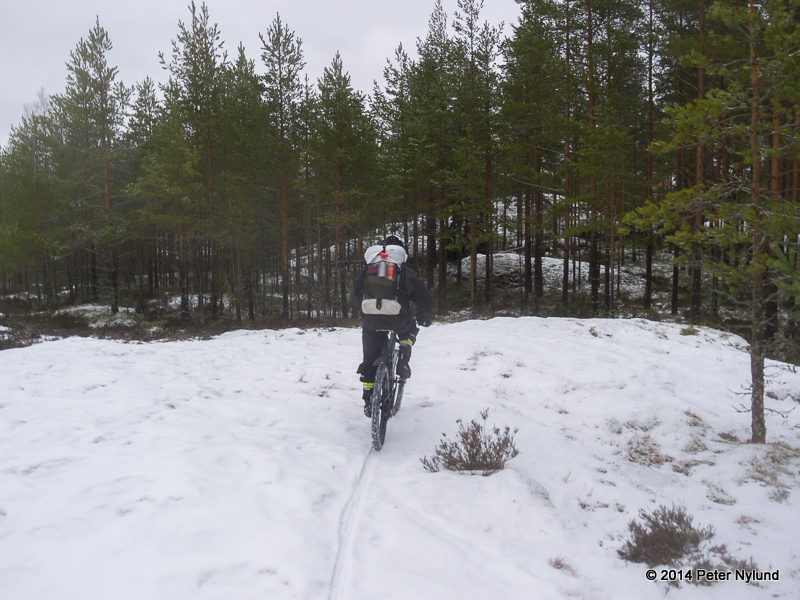 The Rovaniemi 150 race took place in mild temperatures this time and with a good number of participants. My buddy Toni did an excellent race and finished second. He had a reassuring lead 10 km from the finish line, but lost time taking a wrong turn and finished just one minute after the winner. Be sure to check out his blog report next week. 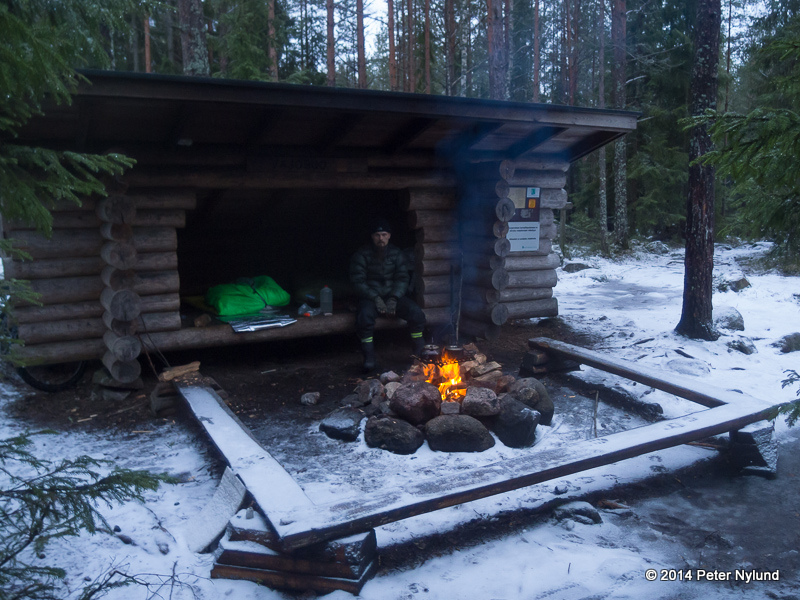 I couldn't go to Rovaniemi, but managed to sneak out on a short overnighter, though. JJ joined me despite a rather short notice. We met at the Rantapiha parking place, where JJ started by switching out a rear wheel with completely destroyed tire. 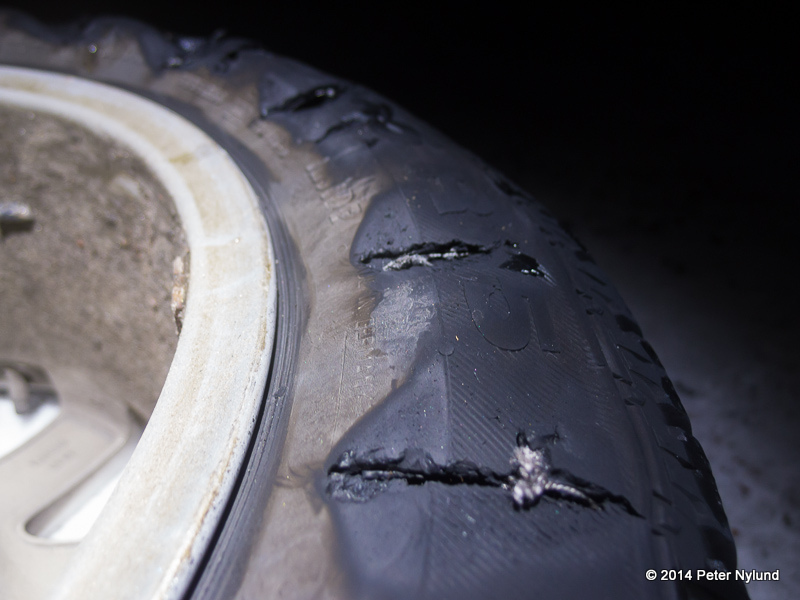 This was actually slightly faster that fixing a flatted fatbike tire. 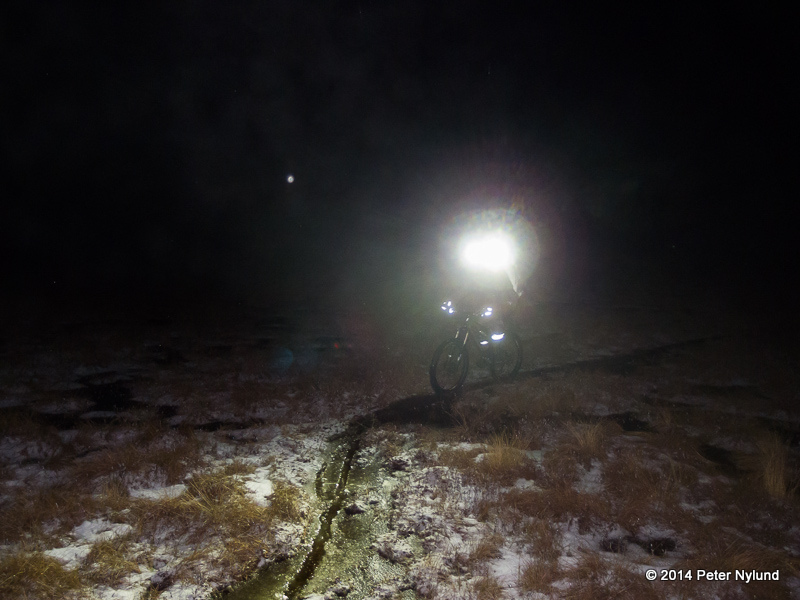 I took my Fargo instead of my winterized fatbike, since there was almost no snow on the ground and I expected the riding conditions to be gritty and miserable and the Mukluk was now nice and clean. 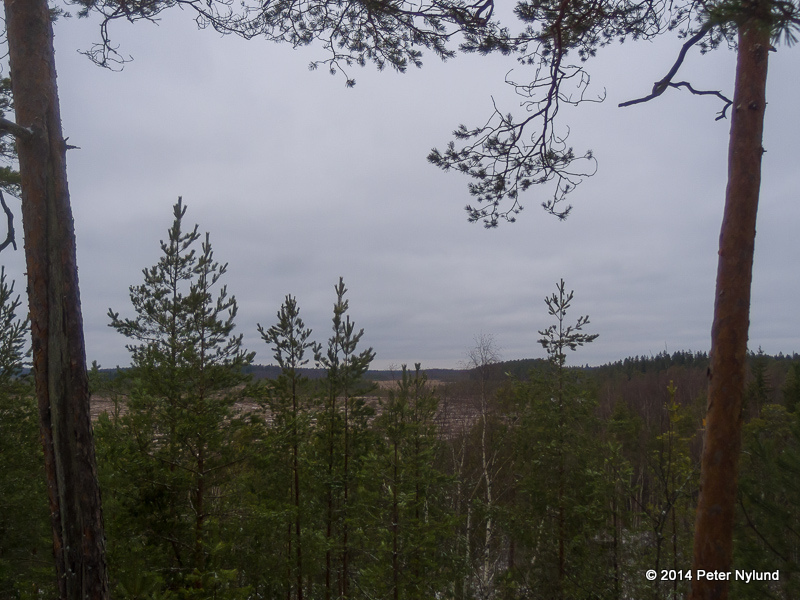 We started on the duckboards north of Savojärvi. It took some time getting used to riding the Fargo on duckboards again. 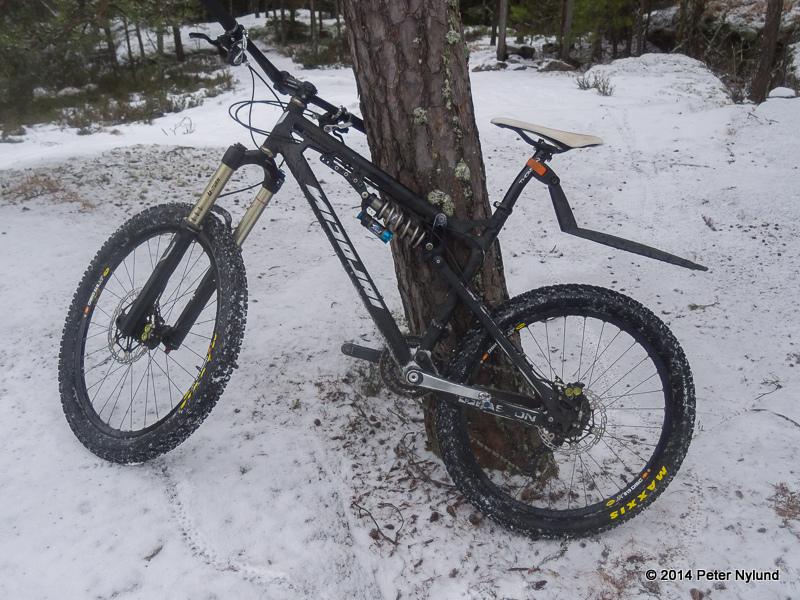 It is a lot harder than the fatbike, since the steering is fast and twitchy. 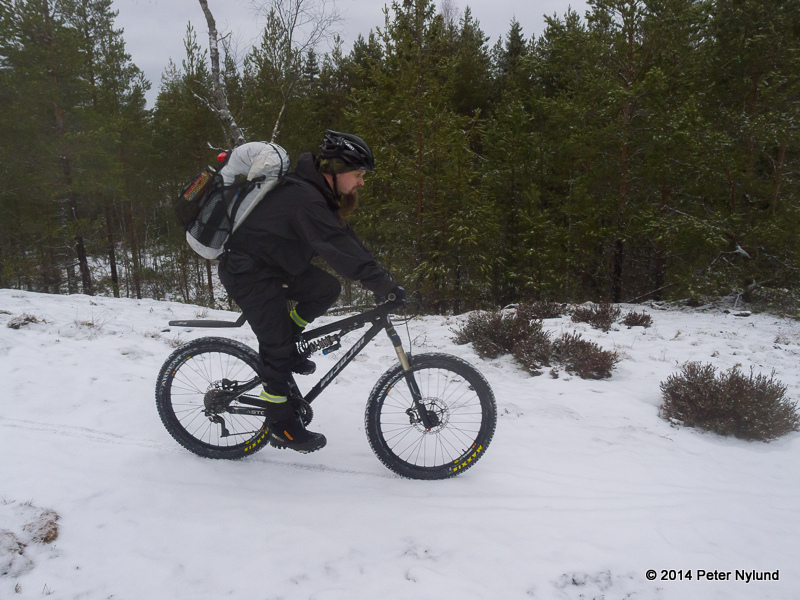 The ice on Savojärvi would mostly be strong enough, but with a good chance for weaker spots, so riding it was no option. Note the placement of the JJ's helmet light. He has two Lupine Pikos on the helmet, mounted Mickey Mouse style, which he claims gives a good depth perception. It certainly works for him. 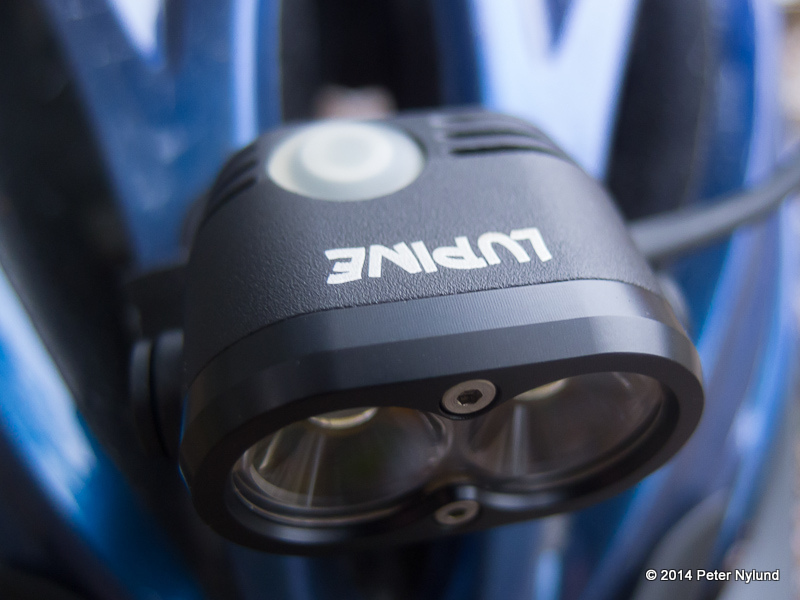 I personally prefer a handle bar light with a wide beam and a helmet light with a slightly narrower beam and more reach. On another mire we found a strange ditch in the mire, just wide enough for riding on and consisting of ice with a 10 cm layer of slush on top. Forest trail. With only the two of us, both with a fairly good riding technique, the riding went quite smoothly. 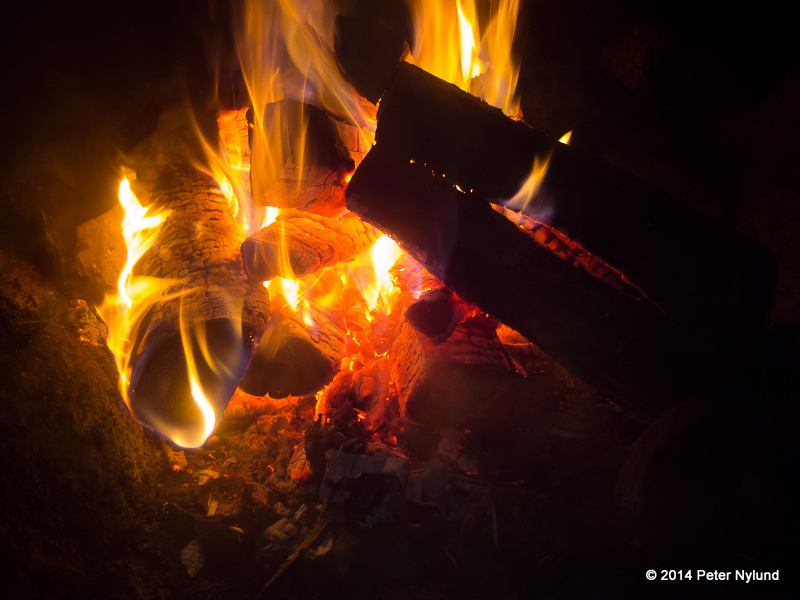 We arrived at the shelter some time before nine and ten o'clock in the evening and got the fire going. 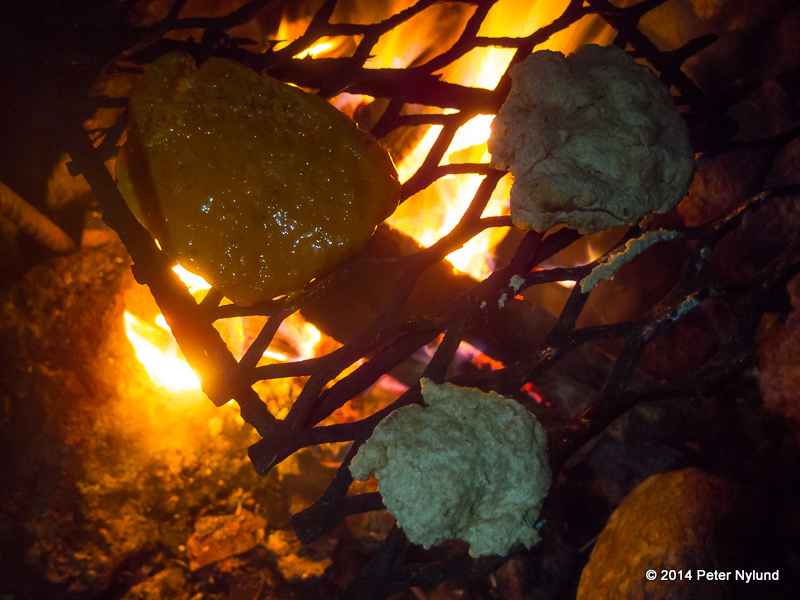 Meat and bread in addition to a little beer. The time was well past midnight before we went to sleep. After too few hours of sleep we got up again, a little before eight in the morning. No hurry in the morning. We started riding, skipped the section south and west of Vajosuo and headed for the remaining nicest section. 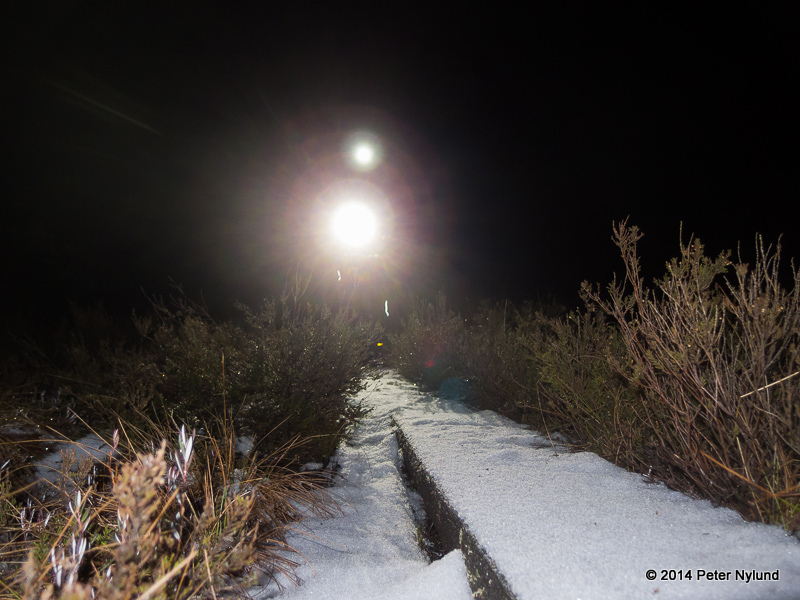 The trails were actually in good condition, despite this being the most miserable winter for ten years or so. 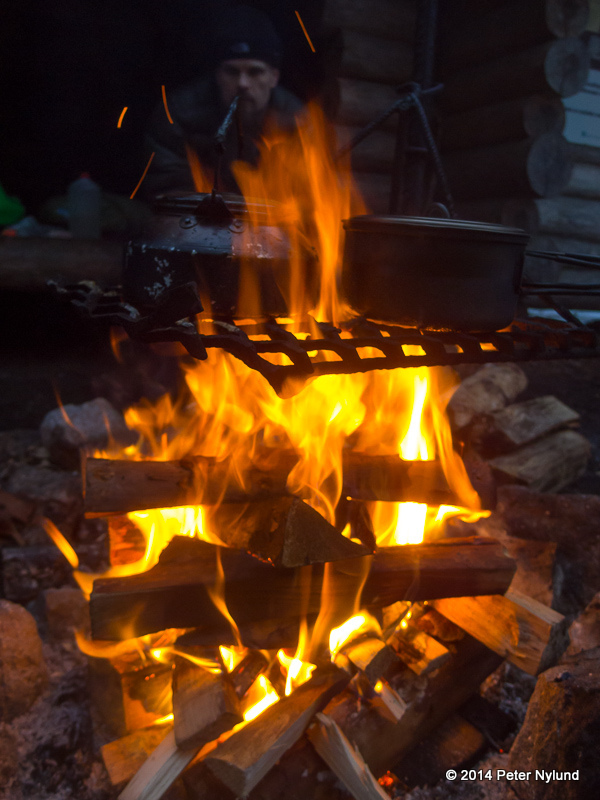 The traditionial break at Takaniitunvuori. Deutsches Licht. I've decided that the development of the led lights have now reached the point when you can buy expensive quality and have it for ten years, without needing any more. 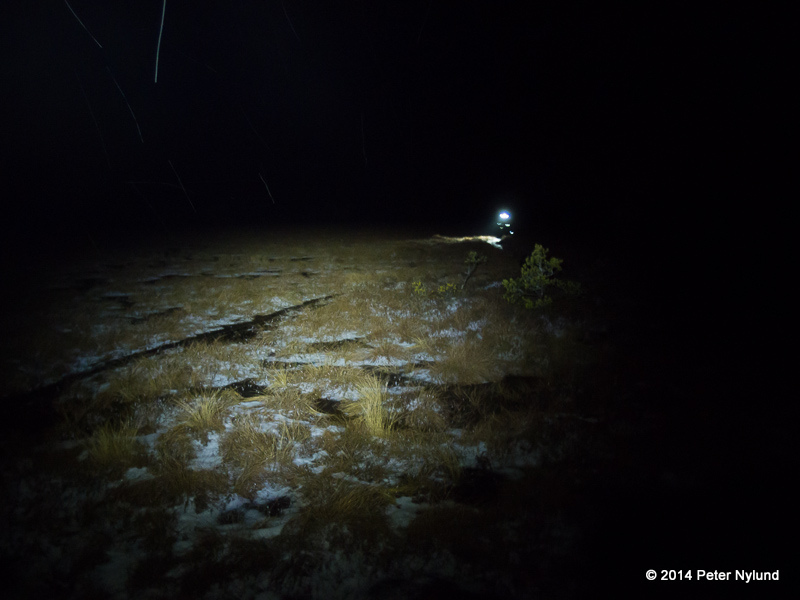 In my experience a total light output of 2500 lm is enough even in the most difficult conditions, like a pitch black cloudy night with the ground wet from a recent rain. 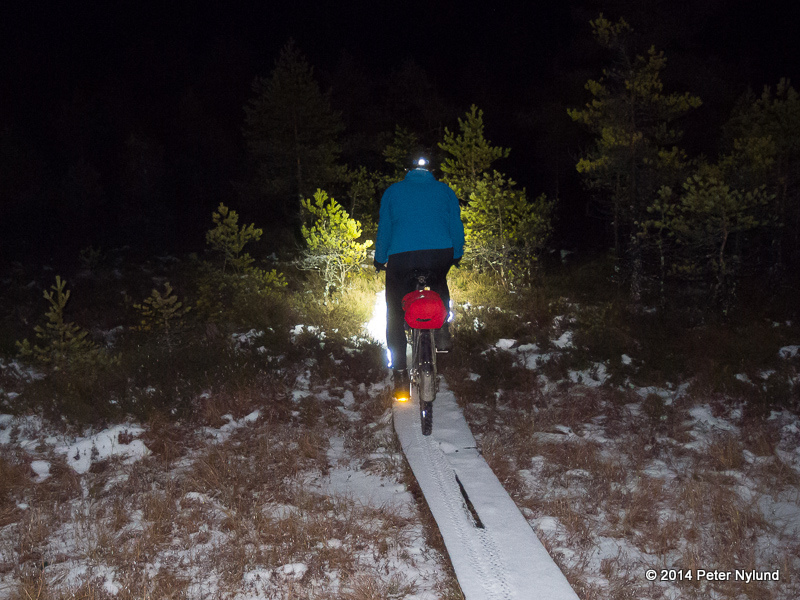 Generally, a much lower amount is sufficient, and before the led lights came we did ride with a single Silva orienteering halogen lamp with a light output of less than 400 lm. 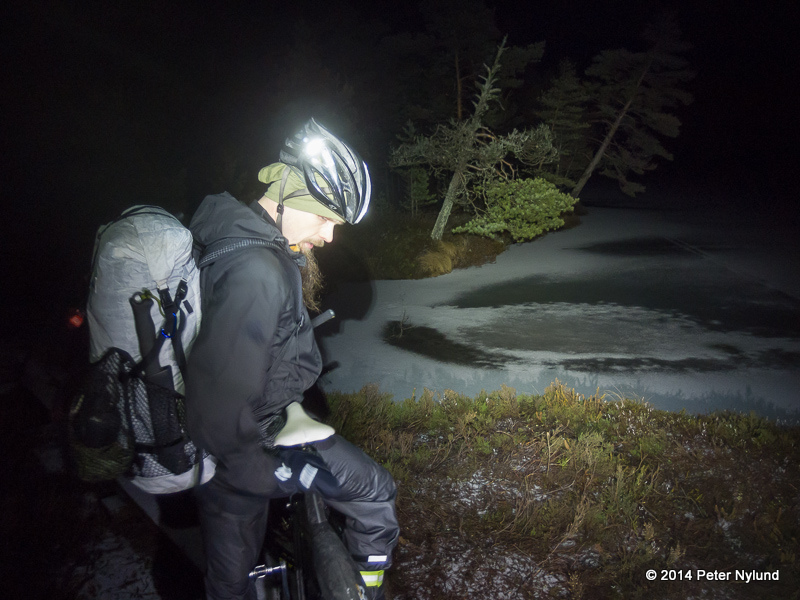 The Lupine Piko is a really light and small light, but outputs 1200 lm if the weather is not too warm, which isn't a problem in Finland. 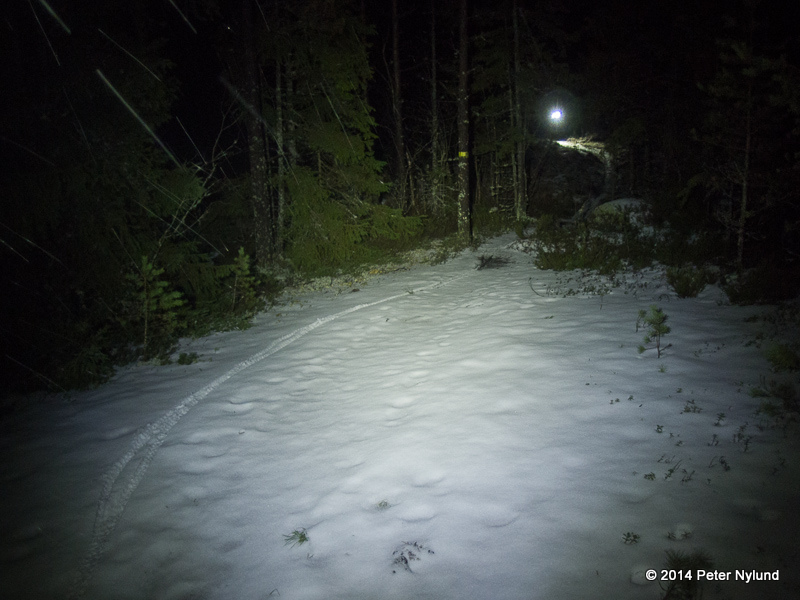 For the next dark season I will probably complement it with a Lupine Wilma (2800 lm with a wide beam) on the handlebar, instead of the current Magicshine MJ-856B with 1200 lm (the Chinese lights are not bad, but the batteries are poor). Doesn't seem like we'll do any mire skiing this winter.. 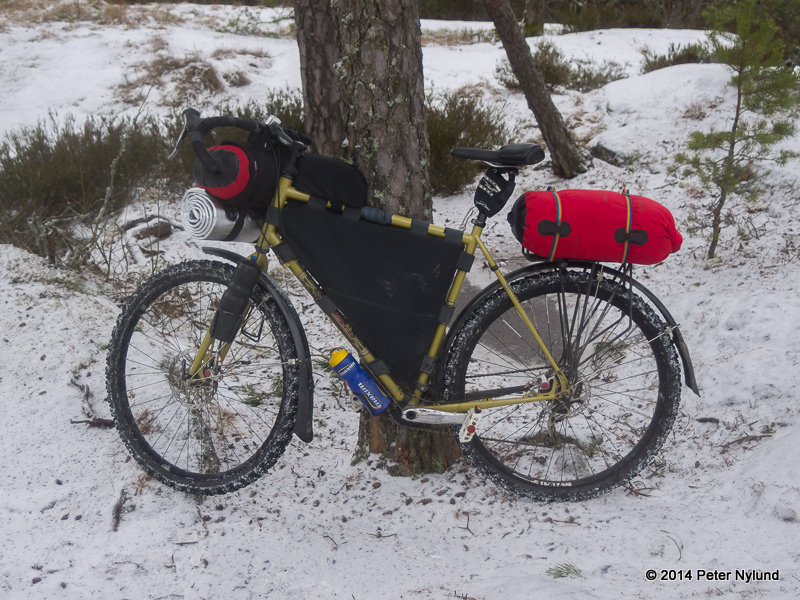 The short overnighter ended and I was home again a little past noon. A surprisingly nice overnighter again and thanks to JJ for the company.